It's all gone quiet over there - over there being Stadium MK. Aside from some choice youngsters being handed new contracts, welcoming them to the professional footballing world, the MK Dons world is quietly waiting for the news of a new manager. Pete Winkelman's patient approach though is calling for exactly that - patience. Fans, like kids on Christmas eve, want to open their presents right now, meet all the new signings, buy the new away kit and revel in winning League 2. But things don't happen like that in football, not really. 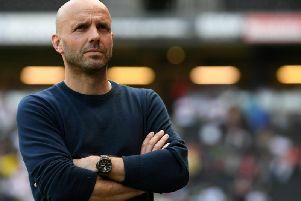 If, as it is widely expected, Paul Tisdale swaps Exeter City for MK Dons, it probably won't happen until next week. For the best will in the world, the 45-year-old may have been sounded out by the Dons board, he may have even sounded them out himself, but had his eye firmly on the ball for the Devon club until Bank Holiday Monday - the League 2 Playoff Final. And wouldn't all parties involved want that to be the case? Even in the aftermath of the defeat, he'd have gone home, collected his thoughts and considered his future a bit more before making any journeys to MK1 for a coffee and a chat. Unfortunately, it doesn't make for much to get irate about on social media, nor does it fill many column inches in the Milton Keynes Citizen. It just means we all have to tread water for a bit, collect World Cup football stickers (own up, you've considered it) or get angry about Raheem Stirling or something. As the chairman has said in pretty much every recorded interview since ditching Dan Micciche back in April, he can't afford to mess up for a third time. His man has to be right, and a few extra days over his self-set deadline won't make much of a difference come August when the season gets underway. If we're still in the position mid-June however, ring the alarm.